Polaris India Pvt. Ltd, a wholly owned subsidiary of Polaris Industries Inc., the world leader in Off-Road and All-Terrain Vehicles showcased the entire 2016 Indian Motorcycles® at the Indian Bike Week 2016 in Goa, which turned out to be a clear favourite amongst enthusiasts. The fourth edition of Asia’s largest biking festival saw bikers riding in from all over India and being enthralled by the most high-end Indian Motorcycle® – New Blue Diamond Indian® Roadmaster® along with Pearl White Indian® Chief® Classic, Indian® Chief Dark Horse®, Indian® Chief® Vintage, Indian® Scout® and Indian® Chieftain®. 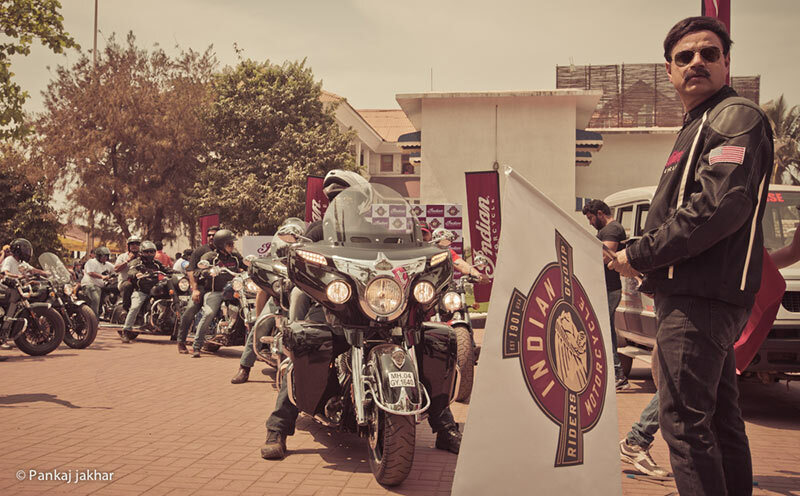 Indian Motorcycle® also introduced the exclusive Indian Motorcycle® Riders Group™ at the India Bike Week. Mr. Pankaj Dubey, Managing Director, Polaris India Pvt. Ltd. rode with the fleet after the flag-off. As a part of the Indian Motorcycle® Riders Group™ members receive recognition for owner experiences, opportunities to share their passion with fellow riders at events and rallies, exclusive benefits to enhance their riding and travel experience and exclusive Indian Motorcycle® Riders Group™ member collectibles and apparel. The 2016 Indian® Roadmaster® reflects pure American luxury. Building upon the iconic Roadmaster™ name used by Indian® in the 1940s, the new Roadmaster® re-imagines Indian Motorcycle® comfort, styling and performance out on the open road, for the long haul. The Thunder Stroke® 111 engine feature styling that pays tribute to legendary Indian Motorcycle® engines of the past. It comes fitted with Horizon Power Windshield with push-button adjustability to customize airflow, provide weather protection, and reduce glare. Fitted with keyless ignition, the key fob of Indian® Roadmaster® offers security and convenience. The comfortable rider and passenger seat feature new desert tan leather, designed to withstand the elements. This sealed, high-quality leather is strong and durable, and it complements the traditional Indian Motorcycle® style. The Indian® Chief Dark Horse® is a cruiser built upon the successful and award-winning Indian® Chief® platform. Unlike other bikes in the Indian Motorcycle® line-up, it is understated with only a flash of chrome and adds a healthy dose of matte black paint to create one of the most confident silhouettes on the market. By all but eliminating chrome from the motorcycle and swapping to cast wheels, the Dark Horse® conveys an aggressive pose, and being the lightest in the series, is the quickest model in the Chief® family. The Indian® Chief® Classic is a pure, powerful cruiser forged from key heritage design elements yet wrapped in advanced design, engineering and technology. It features iconic styling like balanced fenders, rich genuine leather saddle, classic tank-mounted instrumentation, tear-drop fuel tank design, and sculpted and lighted front fender war bonnet. The 2016 Indian® Chief® Classic comes standard with a host of premium features including endless chrome, keyless ignition, ABS, cruise control, throttle-by-wire, true dual exhaust, high quality chrome laced spoke wheels, brake caliper covers, cast aluminum frame with integrated air intake, and much more. The Indian® Chief® Vintage is a soft bagger that takes iconic Indian Motorcycle® styling to a whole new level with handcrafted detail and a signature heritage aesthetic. The Indian® Chief® Vintage offers top-quality quick release soft-sided leather bags, leather fringe, chrome fender tips, vintage chrome badging on the front fender and a quick-release windshield for easy installation or removal. It includes the same premium standard features as the Indian® Chief® Classic, and sports the same iconic design elements like balanced fenders, laced wheels, whitewall tires, tank-mounted instrument cluster and extensive chrome finishes throughout. It is also powered by the new Thunder Stroke 111 engine. The first Indian Motorcycle® of its kind, the Indian® Chieftain® maintains the legendary Indian® Chief® styling, while taking this progressive machine to new heights with advanced features and premium comfort. Unlike any Indian Motorcycle® ever made, the Chieftain® features a fairing with integrated driving lights, and its power windshield is an industry-first for a fork-mounted fairing. Standard features include hard saddlebags featuring remote locks and quick-release anchors, a high-output audio system featuring integrated Bluetooth® smartphone connectivity and a tire pressure monitoring system. Indian® Scout® is an innovative and aesthetically stunning American cruiser. It introduces the first-ever liquid-cooled Indian Motorcycle® engine – an efficient and reliable 69 cubic inch V-twin engine offering 100 HP of performance for impressive power on demand. This new model carries the legendary Indian® Scout® name into the future in authentic Indian Motorcycle® style.